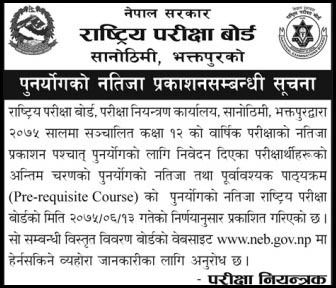 Nepal Examination Board published the re-totaling result of class 12. Students who request to re-totaling after the result of yearly exam 2075 published can check their re-totaling result (grade) in the list below on different subjects. Check NEB Class 12 Re-totaling Result below. Notice That published on Gorakhapatra about NEB published class 12 result.